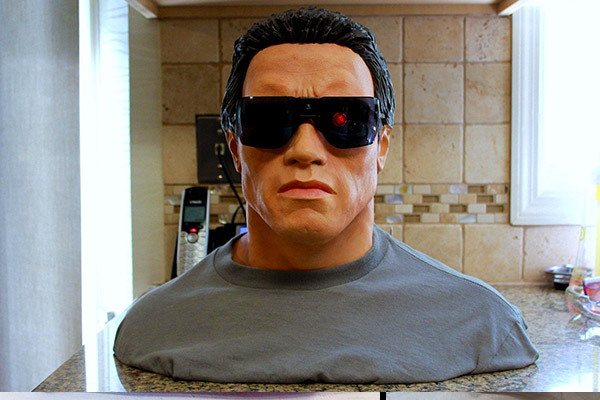 Every Terminator fan needs a custom-made bust of Arnold Schwarzenegger. Terminator Genisys is almost here! The new movie promises to bring us back to the franchise's glory days, which has signaled tons of nostalgia for both 1984's The Terminator and 1991's Terminator 2: Judgment Day. Both were fantastic films, and both inspired more memorabilia than we could ever hope to name, including action figures, posters, and some more "interesting" things. 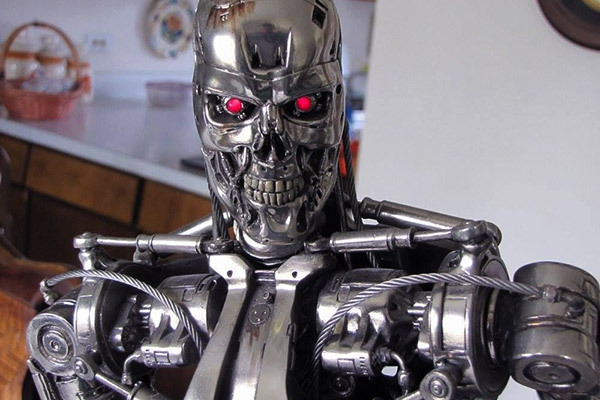 DealNews scoured eBay to find ten of the weirdest (and coolest) Terminator collectibles currently on the market, and we think you'll agree that it'd take an especially devoted T-800 fan to pony up for any of these babies. Remember Rock 'Em, Sock 'Em Robots, the game where two players used boxing robots as their avatars? Well, here's the Terminator version. Can Arnold connect with his deadly right hook, or will the machines win the future with one good uppercut? Allegedly, this is a screen-used prop from Terminator 2. 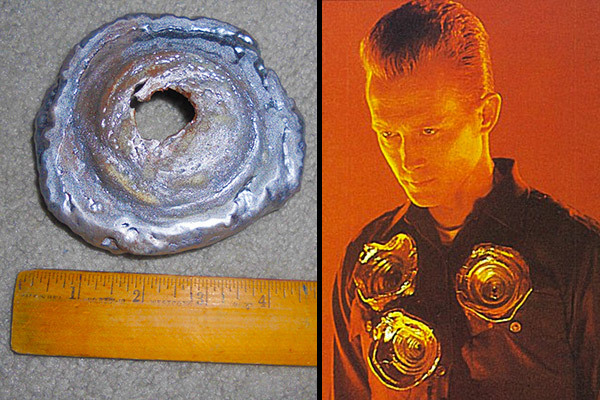 You may recall that the villainous T-1000 was made of liquid metal, which could be shaped into any form. The T-1000 often used it to fashion clever human disguises, but a well-aimed shotgun blast would betray its scary robot origins. 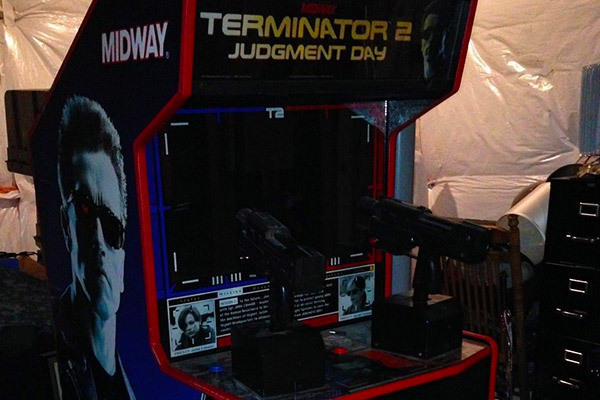 A hundred bucks is a stiff price for a little piece of spray-painted foam, but for the Terminator fan who has everything, this is one heck of a birthday present. 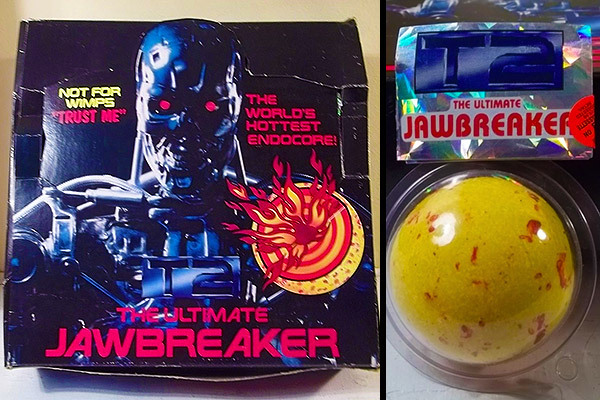 The asking price might seem absurd, but where else are you going to find a display box filled with giant Terminator jawbreakers from 1992? 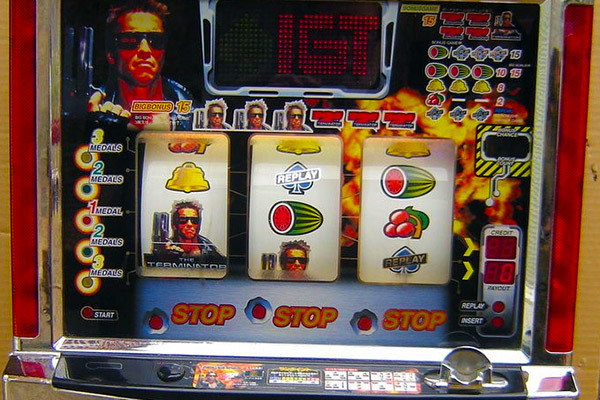 Of the many Terminator-themed video games, this one simply must be the weirdest. 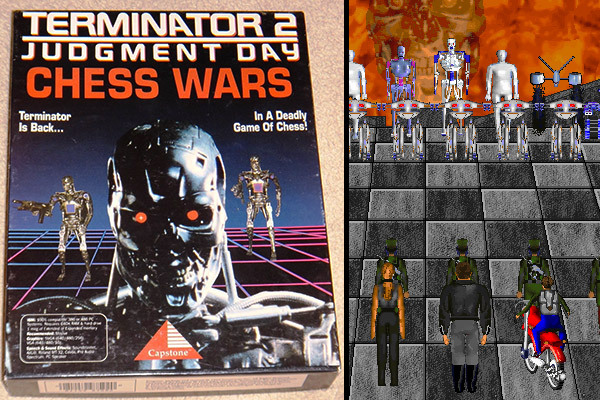 From 1993, the Chess Wars computer game replaced rooks and knights with the likes of Arnold Schwarzenegger and Linda Hamilton. According to Wikipedia, each player was ranked in accordance to the official United States Chess Federation scale. We can't help but wonder if people who bought a chess game with two John Connors instead of bishops really cared about that. A life-sized bust of Arnold Schwarzenegger as a battle-damaged T-800, this one comes with removable sunglasses and a battery-operated light-up eye. We're not ashamed to admit that we want this. It's not the $400 asking price that stops us, but rather the maddening thought of finding the perfect spot for a Arnold Schwarzenegger torso replica. Is this why a lot of newer houses have great rooms? If you're looking for super expensive Terminator statues, eBay has you covered. This limited edition "Cinemaquette" is one of our favorites, mostly because none of the other Terminator statues stand over a pile of human skulls. 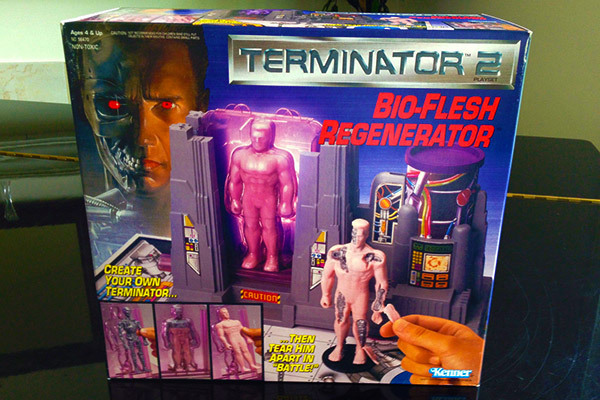 The Terminator franchise came with lots of toys, but none were stranger than the Bio-Flesh Regenerator, a bizarre cross between an action figure and a Play-Doh set. Kids could add rubbery flesh over a Terminator "endoskeleton," and then howl with glee while tearing the skin off. This was the rare toy that let you give life and take it back! Considering that, we can't find fault with the high price. If you spent enough time in arcades during the early '90s, you should remember what a hot ticket this was. 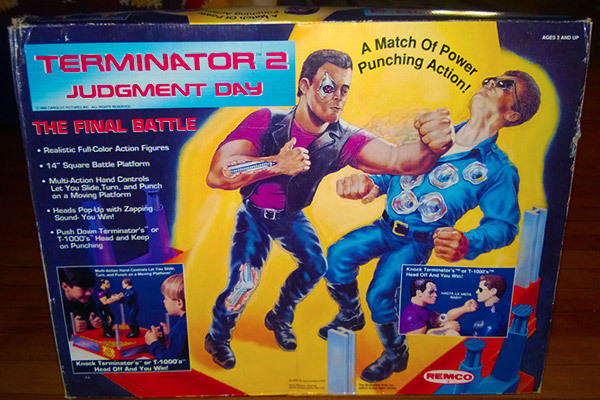 The Terminator 2 arcade game was a two-player shooter where everyone grabbed guns to mow down awful robots. With its impressive sights and sounds, it was 1991's best way to blow a roll of quarters. Even if you're okay with paying $1200 for this, there's still the small matter of needing to drive to Virginia to pick it up. Then again, the best road trips happen for the most ridiculous reasons. If you're thinking about buying this, prepare to do some research: Even slot machines modified to disallow quarters are still illegal in some areas! Terminator 2 made Robert Patrick's career, and we're sure he appreciates that. But we do have to wonder if he ever gets tired of signing glossy photos of his blown-apart face. 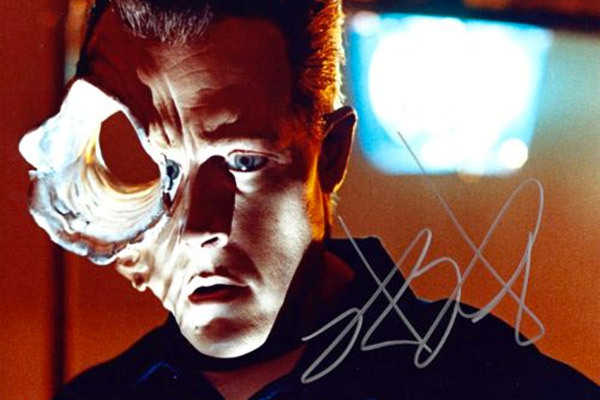 The autograph comes with a certificate of authenticity... which seems rather redundant as we can't imagine T-1000 autographs being a hot enough market to merit forgery. If crime is someone's bread and butter, isn't there a better way? What made you a Terminator fan? The first movie? The sequel? Or was it Kenner's Bio-Flesh Regenerator? Talk about all things Terminator, in the comments! Matt has been blogging about geeky nonsense since early 2000. You can view more of his weird work on Dinosaur Dracula, or follow him on Twitter @dinosaurdracula. Sounds like a great item. If I were you I'd list on eBay with a high Buy It Now price, but also accept Best Offers. Maybe something like $200 or $250 for the Buy It Now, though I'd probably accept an offer in the $150 range. It really depends on the size and "coolness" of the light. Also make sure you charge a pretty substantial amount for shipping, because an item like that will need to be packed extremely well, and I suspect is on the heavier side to boot. Title your auction something like "Vintage Terminator 1980s Video Store Promo Light - Still Works." Wondering if anyone can help?... My mom worked at a movie store in the late '70s- early '80s and she was there for the release of the first Terminator movie! Upon the release of the movie, the store was given advertising posters, and various ad merchandise. One item that caught my mother's interest was a light up Terminator 1 sign. When she left the movie store business, they gifted it to her in appreciation for her years of "rewinding tapes".I have now become the proud owner of this sign which still works perfectly. I'm afraid I don't share my mother's love of all things Terminator, and I felt it might be time to let it go to someone who does. So, my question to anyone listening out there... How would I go about finding a fair price for this item,as I can't seem to find one on any other site I've looked at? Any help would be greatly appreciated!! PS... So sorry my post is so long lol! Well some of those asking prices are ridiculously inflated. A T2 arcade machine, for example, is 3-400 bucks and if you pay more than that you got ripped off. Japanese slot machines are around 200 bucks. As a matter of fact, there is one on eBay for 300 right now. I've seen the bio-regeneration playset for as little as 30 bucks. "I know, now, why you cry... because memorabilia prices are so high."